(CNSNews.com) - The federal government ran a deficit of $215,248,000,000 in the month of February, while taking in $155,623,000,000 in taxes and spending $370,871,000,000, according to the Monthly Treasury Statement. The deficit was the largest the federal government has run in February in five years (when the monthly deficits are compared in constant 2018 dollars adjusted using the Bureau of Labor Statistics inflation calculator). However, the monthly deficit was 11.27 times more than the $19,095,650,000 drop in taxes the American people saw in February 2018 compared to February 2017. The last time the February deficit exceeded $215 billion was in 2013, when Barack Obama was president. That year it hit $217,304,000,000 in constant January 2018 dollars. In fact, the February monthly deficit exceeded this year’s total of $215,248,000,000 in five of the eight years Obama was in office. That was the case in 2009 ($226,450,680,000 in constant January 12018 dollars); 2010 ($252,633,560,000); 2011 ($249,208,760,000); 2012 ($252,237,220,000); and 2013 ($217,304,000,000). The federal government collected $19,095,650,000 less in taxes in February 2018 than it did in February 2017, according to the Monthly Treasury Statement. February was the second month that the tax cut signed in December by President Donald Trump was in effect. In January, the first month the Trump tax cut was in effect, the federal government ran a surplus of $49,237,000,000. At the same time that the federal government was collecting $19,095,650,000 less in taxes in February 2018 than it in February 2017, it was also running a February 2018 deficit that was $19,842,480,000 larger (in constant 2018 dollars) than the deficit it ran in February 2017. In February 2017, the federal government collected $174,718,650,000 in total taxes (in January 2018 dollars). That was $19,095,650,000 more than the $155,623,000,000 in total taxes collected this February. This February, the federal government spent a total of $370,871,000,000. Last February, it spent $370,124,160,000 in constant January 2018 dollars. That made this February’s federal spending $746,840,000 more than last year’s. This year’s taxing and spending in February resulted in a deficit of $215,248,000,000 for the month. Last year’s taxing and spending in February resulted in a deficit of approximately $195,405,520,000 in constant January 2018 dollars. That made this year’s February deficit $19,842,480,000 larger than last year’s. 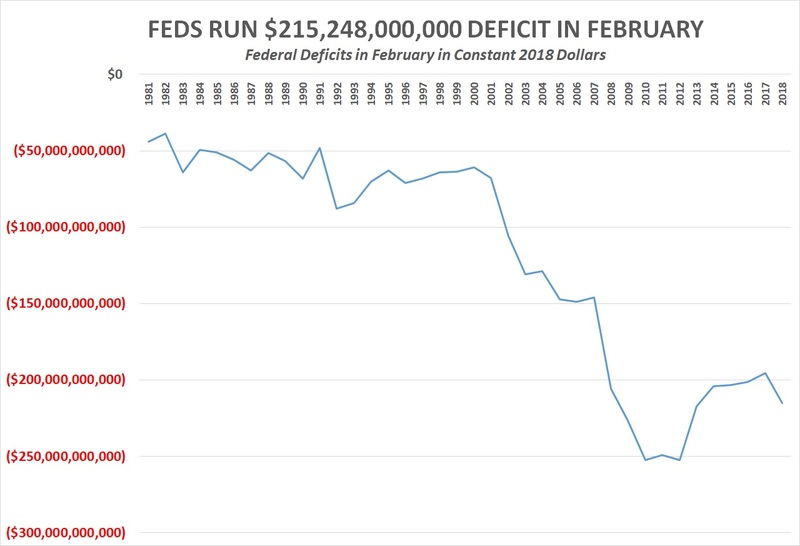 The largest federal deficit ever recorded in February was in February 2010, when the deficit was $252,633,560,000 in constant January 2018 dollars. In the years since 1981, the smallest the deficit has been in February was 1982, when it was $38,725,940,000 in constant January 2018 dollars. The February deficit first broke $100 million in 2002, when it hit $106,027,970,000 in constant January 2018 dollars. It first broke $200 million in 2008, when it hit $205,563,120,000; and it first broke $250 million in 2010, when it hit $252,633,560,000. So far in fiscal 2018, which began on October 1, the federal government has taken in a total of $1,286,172,000,000 in tax revenues, while spending $1,677,137,000,000 and running a deficit of $390,965,000,000. February is the shortest month of the year. In three out of four years, it has 28 days. In the fourth year, which coincides with U.S. presidential election years, a 29th day is added to February. Thus, in 2017 and 2018 there were 28 days in February.